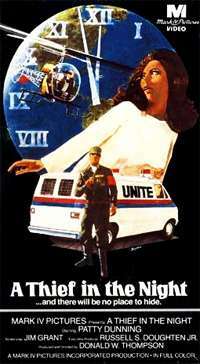 A Thief in the Night is a 1972 Christian end times film produced by Russell S. Doughten. It is the first and best known film in Doughten's four-part series on the Rapture and Second Coming of Christ. The films together are often referred to collectively as the "Thief" or "Rapture" series. The film's title is taken from First Thessalonians 5:2, in which Paul warns his readers that "the day of the Lord so cometh as a thief in the night". In the film, everyone must receive the mark of the beast, consisting of three rows of the digits "0110" written on their forehead or hand, or they will not be allowed to use money in any way, even to buy food or water. The number "0110" in binary is six, hence having it repeated three times suggests the biblical number attributed to the end times (though concatenating the "mark" into the single number 011001100110 does not yield six hundred sixty-six in binary, but 1,638). The use of the number 666 as a mandatory marking of service to the Antichrist is a common interpretation of Revelation 13:16-18. This film is the first in a sequence of four. The first two films out of the four in the series, concern Patty and her two female friends. The chief conflict is whether or not Patty will take the Mark of the Beast or not, in the face of the threat of execution by the forces of the Beast. Patty Jo Myers is a young woman who considers herself a Christian because she occasionally reads her Bible and goes to church regularly, where the pastor is really an unbeliever. She refuses to believe the warnings of her friends and family that she will go through the Great Tribulation if she does not accept Jesus. One morning, she awakens to find that her family and millions of others have suddenly disappeared. Gradually, Patty realizes that the Rapture, an event some interpret from the Bible, has happened and she and everyone else left behind are entering into the Great Tribulation, the last days of Earth, dominated by the Antichrist. A government system called UNITE (United Nations Imperium of Total Emergency) is set up and those who do not receive the mark identifying them with UNITE will be arrested. Patty desperately tries to avoid the law and the mark but is captured by UNITE. Patty escapes but is cornered by UNITE on a bridge, and falls from the bridge to her death(in the dream state). Patty then awakens, this time for real, and realizes that all she had experienced was only a dream. Her relief is short-lived when the radio announces that millions of people have disappeared. Horrified, Patty frantically searches for her family only to find them missing too. Traumatized and distraught, Patty realizes that the Rapture has indeed occurred and she's been left behind. In the ensuing plot the questions are 1) will she be caught (as in her dream she was caught), and 2) will she take the mark to escape execution. The plot is somewhat hard to understand in the second film because the story of Patty is told in flashbacks within flashbacks. But it ends dramatically with Patty tied in the guillotine, while an eschatological earthquake starts. The audience is on tenterhooks waiting to see if she escapes or not. This film includes Larry Norman's composition I Wish We'd All Been Ready, one of the earliest Christian rock hits and one of Norman's best-known releases. A Thief in the Night has been seen by an estimated 300 million people worldwide. It was a pioneer in the genre of Christian film, bringing rock music and elements of horror films to a genre then dominated by family-friendly evangelism. A quarter century later, the authors of the broadly successful Left Behind series of books and films have acknowledged their debt to Thief. Indeed, even the title "Left Behind" echoes the refrain of Norman's theme music for A Thief in the Night. ↑ Dispensationalism, including the doctrine of the Rapture, is generally rejected by Roman Catholics, Orthodox Christians, Lutherans, and Reformed Christians, who together make up a large majority of Christians globally. 1 2 3 4 5 Dean A. Anderson, The original "Left Behind", Christianity Today, Published 7 March 2012, Retrieved 13 March 2012. ↑ Michael D. Guinan, "Raptured or Not? A Catholic Understanding", Catholic Update, October 2005, http://www.americancatholic.org/Newsletters/CU/ac1005.asp . Cf. "Catechism of the Catholic Church - The Profession of Faith". Vatican.va. Retrieved 2011-10-21. ↑ Anthony M. Coniaris, "The Rapture: Why the Orthodox don't preach it," Light & Life Publishing, Life Line, September 12, 2005, Volume 2, Issue 3, available at https://web.archive.org/web/20121109035607/http://www.light-n-life.com/newsletters/09-12-2005.htm ("As already stated, most Christians, Orthodox, Roman Catholics and Protestants do not believe in the Rapture.") (Orthodox commentary), last accessed January 27, 2012. ↑ Brian M. Schwertley, "Is the Pretribulation Rapture Biblical? ", Reformed Online, http://web.archive.org/web/20130311041013/http://reformedonline.com/view/reformedonline/rapture.htm, last accessed January 27, 2012. ↑ These paragraphs are supported by the primary sources, the four movies, readily available to all.